It's going to snow this week, so, like a glutton for disappointment, I hurried out to Alpine Gardens in Silverthorne to buy flowers to plant in my hanging baskets. It's still cold, so I used some restraint and only got enough for three baskets or Red-Wave petunias and other flowers that Sherrie, the owner of Alpine Gardens, recommended. It's so nice to have a locally owned nursery that cares if the plants are meant for our environment -- or not. Not everything will grow well at 9,600 feet above sea level. I want to make sure I can show all my blog readers great views from the deck this summer, so these are going to be babied, and more will be forthcoming. I can't wait for warmer weather. 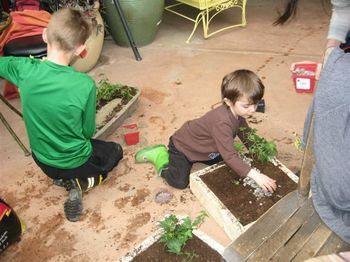 While I was in Alpine Gardens, kids were planting what Sherrie calls 'window box fairy gardens'. She is standing, wearing red and a nice gardening smock, in first photo. 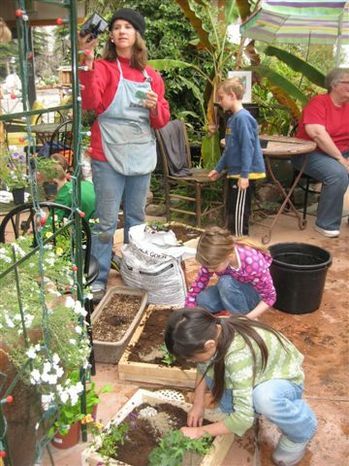 Alpine Gardens is also working with Dillon Valley Elementary to build a garden that the students can tend, and helping the Summit Prevention Alliance with the greenhouse project at the Senior Center in Frisco. When you see the YouTube video of the constructions -- and snow is falling in front of the camera -- you can see why a greenhouse will be very useful in Summit County. This page is an archive of recent entries in the Silverthorne category. Great Priced Property in Breckenridge is the previous category. Summer in Breckenridge is the next category.